We wake up amid sand dunes but far from a beach. Monahans is a weird place. I take down the tent and pack up while Bryan sets up the tripod for photos. The visitors center rents discs for a dollar and sandboards for two. 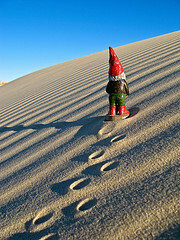 I take the last picture of our gnome, walking up a dune toward the sunshine. Tonight we'll sleep in our own bed, at home. There's nothing out here: the speed limit's 80 and that seems like a good idea. Dairy Queen has supplanted McDonald's as the fast food chain of choice. We drive past miles and miles of scruffy, ugly pasture land and oil rigs. Odessa is dirty and sad-looking and Midland, while surprisingly large, isn't much better. The businesses along the highway are all drill-rig and tank and pipeline suppliers. The sky is big, though, and blue. Texas is interminable, never-ending. They're proud of being the "Lone Star State" but don't realize that this is nothing to be proud of: one star means BAD service. I drove a lot today but I don't think it helped much. We pull out all our long-trip tricks: Gogol Bordello, They Might Be Giants, Shel Silverstein. And we're not even in Arkansas yet. We're torn between not wanting to end a great trip, and the realization that a hot bath in our own tub sounds wonderful. Both of us have very sore calves, odd since we felt good for the whole hike: maybe that long downhill at the end is what hurt us. (I'm pleased and surprised that my shins and knees (which are often a problem) are perfectly fine; the combination of trekking poles, good boots, and insoles saved me.) We must look funny, each time we stop to get gasoline, lurching and hobbling around the truck on our sore legs. Click to see the panorama larger! We arrive home before midnight. The house is fine, and so are the cats, in spite of our worry, or perhaps because of it. We unload the truck, close the garage, and go to sleep in our own bed. Bryan told me the other day about a photographer who had assembled in one place a collection of his life's best work, a hundred great shots. Averaging 1/100 of a second each, the whole set represented one second of his life. One second. Is this the way all our lives work? Is it the tiny details that are important, rather than the big story? At the end of my life, will there be a hundred little bits of beauty, shifts in perspective, pieces of kindness and truth and love and joy, that will represent my life? Could there be a book of a hundred pictures that will let me say "Look at these: this is what was important about the person I tried to be?" Here are the photographs I would include from this trip: The feeling of a pack on my back as walk into the desert. The sound of Mandy's voice on the phone, eager and curious. The smell of bacon frying in a tent doorway. The sound of the snow falling on the trail past Juniper Basin. The way Bryan's hand felt in mine as we looked out together at the purple mountains. 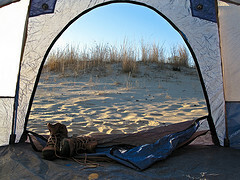 Bryan taking photos and Aly warming her feet in the bathroom at Monahans Sandhills State Park. Don't forget to check out our Flickr page for more photos from our trip. Also, let us know if you liked the "blog" format of our trip-report. 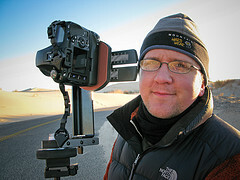 If it goes over well, look for future adventures to be posted here at http://summerwood.blogspot.com.